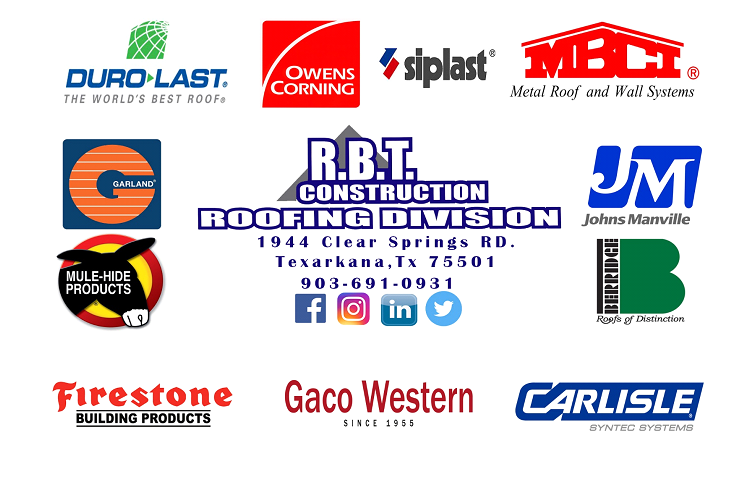 Here at R.B.T Construction Roofing Division we always strive to provide you with the absolute highest quality roofing products the industry has to offer. We always try to meet any specification when it comes to roofing projects. Not sure if we have the right fit for you? Give us a call today to speak with one of our experienced commercial roofing experts at 903-691-0931. Firestone, when most people think of Firestone the first thing that comes to mind is their tires. But did you know that Firestone is also an industry leader when it comes to high-quality commercial roofing products? If you’d like to learn more about the different roofing options available to you call the experts at R.B.T Construction Roofing Division today at 903-691-0931. Carlisle SynTec Systems has been the leader in the commercial single-ply roofing industry for more than 50 years. It continues to lead the roofing industry today by providing its customers with superior roofing systems and services through a select network of manufacturer’s representatives, distributors, and applicators. Carlisle’s products have been installed on a wide range of buildings around the world, including schools, hospitals, warehouses, and cold storage facilities. With more than 19 billion square feet of roofing materials sold, Carlisle continues to lead the industry by providing its valued customers with the best products, services, and warranty options available today. Johns Manville is a leading manufacturer and marketer of premium-quality insulation and commercial roofing, along with glass fibers and nonwovens for commercial, industrial and residential applications. Their history goes back to 1858 when the H.W. Johns Manufacturing Company began operations out of a tenement building in New York City. Berridge Manufacturing Company specializes in the research and development of architectural sheet metal products. Since 1970, it has provided customers with the industry’s highest quality metal roofing and siding products. MBCI, Since 1976, MBCI has provided customers with quality metal roofing and wall products, superior service and competitive pricing. We remain the industry-leading manufacturer of metal roofing and metal wall panels and other products. With our large product selection and full engineering and design capabilities, MBCI is fully capable of supporting both the design community and our customers from project conception through project completion. Mule-Hide Products is the right choice for a broad range of roofing applications. Mule-Hide time-proven systems are simple and economical to install, yet meet the stringent demands of today’s new construction or re-roofs of commercial, industrial, and institutional buildings. Mule-Hide membranes are manufactured under strict quality control in a wide range of sheet sizes, lengths, and membrane thicknesses. Available through one of the largest distribution networks – nationwide and in Canada. Siplast, The Siplast story of uncompromising quality and commitment to our customers begins over half a century ago with an innovation that would change the commercial roofing and waterproofing industry. In the late 1960s, Siplast Research and Development, working in conjunction with Shell Chemical of Europe, developed SBS (styrene-butadiene-styrene) modified bitumen. We found that by properly modifying asphalt with SBS, we could produce a highly durable elastomeric blend with exceptional elongation/recovery properties over a wide range of temperatures. The Garland Company, Inc. is one of the worldwide leaders of quality, high-performance roofing and building envelope solutions for the commercial, industrial and institutional markets. For more than 120 years, Garland has continually developed unique product and service offerings that have raised the bar of performance while exceeding the individual needs of customers throughout the world. Updated on September 13, 2018 at 1:31 pm by R.B.T. Construction Roofing Division.